PARENTS will face tough new hurdles if they want to enroll unvaccinated children at school, under a crackdown being planned by Health Minister Tanya Plibersek. Responding to The Sunday Telegraph and The Daily Telegraph’s campaign to improve childhood immunisation rates, Ms Plibersek said it was time for a “rigorous” national policy to identify children who had slipped through the immunisation net when they started school. She has asked the states to introduce standardised procedures that will make it mandatory for parents to produce the official Australian Childhood Immunisation Register record to prove their children have been fully immunised when they enrol them at school. And parents may have to document why a child is unvaccinated if the record shows the student has not completed the government’s free childhood immunisation program. The latest immunisation data from the National Health Performance Authority shows five year olds have the lowest immunisation rates of any children. “I am proposing we introduce a rigorous nationally consistent policy for schools to assess and document immunisation for all new enrolments as a way of identifying children who have slipped through the immunisation net or have not yet met the immunisation milestones,” the minister said. “Ensuring accurate records are available at schools will assist in promoting immunisation of children and improving the control of spread of vaccine preventable diseases by excluding children from school during an outbreak if they are not immunised,” Ms Plibersek said. She said Western Australia, NSW, Victoria, Tasmania and the ACT have school entry legislation for immunisation but, other than in Western Australia, “the laws are not usually enforced”. The minister is also asking her department to investigate the national roll out of a “booster pack” which would include an illustrated book and pamphlet on immunisation that would be sent to parents of four year olds. A similar pack used in South Australia to remind parents about the two vaccinations that are given to four year olds has seen immunisation rates among five year olds in that state increase from 88.8% to 91.1% since the middle of last year. Immunisation experts and the Australian Medical Association have been calling for governments to increase the hassle factor for parents who have failed to properly immunise their children. Australian Medical Association president Dr Steve Hambleton said he fully supported the school enrolment crackdown. 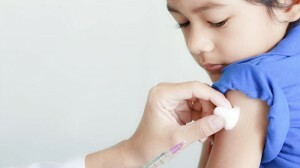 “It means parents will now have to make an active decision to refuse vaccination,” he said. “I congratulate the minister on her leadership and challenge the state ministers to match it,” he said. The World Health Organisation says immunisation rates higher than 93 per cent are required to stop the spread of killer diseases like whooping cough and measles. But in some areas around the country, less than 85 per cent of five year olds are fully immunised. The minister wrote to all state health ministers yesterday to tell them she would be including an item on increasing vaccination rates among school children at the health ministers meeting due mid year.